Every December we celebrate National Influenza Vaccination Week to remind everyone about preventing influenza, a serious disease that can lead to hospitalization and sometimes death. Every flu season is different, and influenza infection can affect people differently, but millions of people get the flu every year, hundreds of thousands of people are hospitalized and thousands die from flu-related causes every year. Even healthy people can get very sick from the flu and spread it to others. Flu season” in the United States can begin as early as October and last as late as May. An annual seasonal flu vaccine is the best way to reduce your risk of getting sick with flu and spreading it to others. When more people get vaccinated against the flu, less flu can spread through that community. 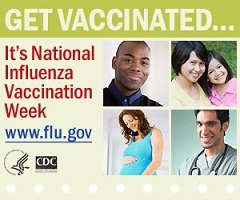 Flu vaccines cause antibodies to develop in the body about two weeks after vaccination. These antibodies provide protection against infection with the viruses that are in the vaccine. Vaccination is needed every season because the body’s immune response from vaccination declines over time, and because flu viruses are constantly changing, which necessitates annual updates of the formulation of the flu vaccine. For the best protection, everyone 6 months and older should get vaccinated annually. There is still a possibility you could get the flu even if you got vaccinated. The ability of flu vaccine to protect a person depends on various factors, including the age and health status of the person being vaccinated, and also the similarity or “match” between the viruses used to make the vaccine and those circulating in the community; if they are closely matched, vaccine effectiveness is higher. If they are not closely matched, vaccine effectiveness can be reduced. However, even when the viruses are not closely matched, the vaccine can still protect many people and prevent or lessen flu related complications. The viruses in the flu shot are killed (inactivated), so you cannot get the flu from a flu shot. Some minor side effects that may occur are: soreness, redness, or swelling where the shot was given, low grade fever and body aches. Another goal of National Influenza Vaccination Week is to communicate the importance of flu vaccination for people who are at high risk of developing serious flu-related complications. People at high risk of serious flu complications include young children, pregnant women, people with certain chronic health conditions like asthma, diabetes, heart disease or lung disease, and people aged 65 years and older. For people at high risk, getting the flu can be more serious than for other people. Flu is more likely to lead to hospitalization or death for people at high risk. About 100 deaths from influenza among children are reported each year to the CDC.